Austin Dressage Unlimited (ADU) began its first membership year as a Dressage educational organization in 2009. We would like to recognize our very first club member and our 100th member to our organization in that inaugural year! Barbara Carstens, thank you so much for being our 1st MEMBER, and Barbara Vander Weele, thank you for being our 100th MEMBER. Each of these members received an ADU recognition award for being these distinguished numbers. We did not officially launch our organization until December of 2008 and by the end of January 2009 had already reached 100 strong. By the summer we had reached nearly 130 members. Our planning committees were busy setting up educational Dinner & DVD Nights, Training Workshops, Practice Shows, besides many other Dressage Educational activities and Special Events to support our mission. If anyone is interested in joining this fast growing active group, pleased print out a membership form from this website and send it to our current Membership Team Leader. We welcome everyone! WOW! Our ADU - University Program didn't just begin in 2009, it launched! ADU-U exploded with all of the enthusiastic participation! Thanks to all 30 of you who enrolled in its inaugural year. It has been great to see the response. It just goes to show that there are a lot of people out there who are dedicated to expanding their Dressage education and improving and progressing in their Dressage skills. This ADU-U training system for continuing education was designed to help do just that for our ADU members, no matter if they are just starting out in Dressage, or are FEI riders, or are USDF trained/certified/licensed officials. Dressage is a life long learning process. 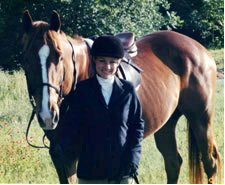 Austin Dressage Unlimited would like to recognize our 1st and our 30th "student" to enroll in our ADU-University Program in the 2009 Inaugural Year. Our 1st student to enroll in ADU-U was Suzy Remmert. Born in Austin and living in Hutto for the past 15 yrs, Suzy works for the toy company, Lego. She started riding about 30 yrs ago when she received a horse as a graduation present. First it was pleasure riding, then she and her Thoroughbred gelding, Solo, successfully competed in hunter/jumper for about 8 yrs. 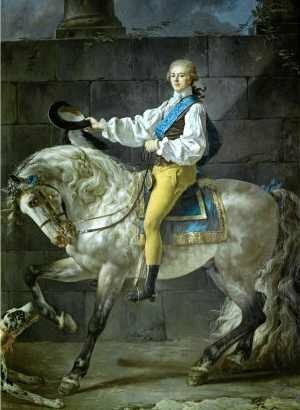 "After too many injuries and broken bones I decided to try my hand at Dressage. Plus, I have always thought it was a beautiful sport. To be so in sync with my horse I thought would be amazing." So Suzy and Solo switched to Dressage about 7 yrs ago. Then came Austin Dressage Unlimited, and the introduction of the ADU-University program. Suzy was the first member to sign up for ADU-U when she attended the ADU "Band in the Barn" Inaugural Membership Party last November. "I signed up for ADU University because I thought it would be a great 'kick in the pants' to me to finally start achieving the goals I have wanted to, but just haven't gotten around to yet. I have also wanted to get to know more people in the Dressage world and knew this was a great way to do that. So far it has met all my expectations and I really love it!!! Everyone seems to want to help each other and support one another." Our 30th student to enroll in ADU-U is Rebecca Lehndorf. Rebecca was raised in Wisconsin. "My Mom says I was born on horseback. She has been a strong mentor in my horse life and is a strong advocate of Dressage. So if I say how many years I have been riding, I will give away my age!" Rebecca now lives outside Bertram, and works in Georgetown as an Engineering Technician. As a teen, she was bit with the jumping bug. Then as a poor college graduate in New Mexico, she bought a rank western cow-pony. A close friend introduced her to Eventing and the pair became hooked on this sport. 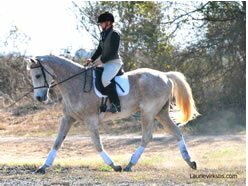 Rebecca eventually moved to Texas and found Jupiter, her gray Thoroughbred gelding, who she has had many successful years with competing in eventing. But Rebecca's Mom's continued support and recommendations always encouraged her to take the "third" element of eventing, that is, Dressage, seriously. Rebecca does have a young mare who is currently in foal with what Rebecca hopes is her future upper level Dressage horse. Rebecca heard about Austin Dressage Unlimited and "jumped" at the chance to join and participate. She also participated in one of our first Warm-Up & Test Riding Workshops, focusing on Eventers, hosted by Brookstone Farm. Rebecca then learned about our ADU-University program and enthusiastically enrolled in it to advance her Dressage knowledge and skills. "As a rural rider, it is hard to make connections/contacts in the horse community. I signed up to network with people who care to share their passion. A formal program with a mentor really gives me a strong feeling of support that we some times need in our busy lives to stay focused with our hobby. I really feel this program can help me advance in Dressage, where I have otherwise been stuck. I truly hope to make new friends and enjoy camaraderie. This is an awesome opportunity! I love what the program offers for training opportunities." Thank you and Congratulations to our 1st and our 30th ADU-University students, Suzy Remmert and Rebecca Lehndorf! They each received a recognition award from ADU.